Kraft First Taste brings you samplicious – a crispy, gooey, cheesy sampling experience. Be among the first to taste full-size packs of our newest products and let us know what you think. 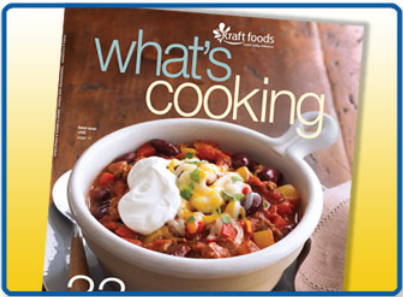 Plus, get a copy of what’s cooking magazine for lots of tasty ideas! NOTE - you do have to pay the S&H of $9.95 + taxes - and you will need a credit card to do so. But you get $45 worth of product! Here is what they are sending - it only cost me $11.24 total! Your First Taste package will be delivered Expedited Parcel Post via Canada Post, and it will be delivered to the address you provided within 30 days of placing your order.